A curator-led tour will begin at 6 pm exploring the current art exhibitions. Free admission and exclusive for THELMA members, listen to a Q&A talk and learn about her process, inspiration, and execution of her work. Cash bar and snacks available. Liz Miller received her BFA from the Rhode Island School of Design and her MFA from the University of Minnesota. Miller’s work has been featured in numerous solo and group exhibitions throughout the United States and abroad. Her awards include a McKnight Professional Development Grant from Forecast Public Art, a McKnight Foundation Fellowship for Visual Artists, a Joan Mitchell Foundation Painters & Sculptors Grant, an MCAD/Jerome Foundation Fellowship, and five Artist Initiative Grants from the Minnesota State Arts Board. 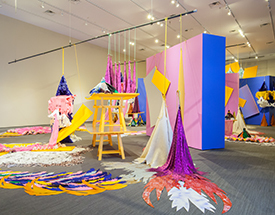 Miller recently completed residencies at the Joan Mitchell Center in New Orleans, LA and the McColl Center for Art + Innovation in Charlotte, NC. She lives and works in Good Thunder, MN and is Professor of Installation and Drawing at Minnesota State University-Mankato. My work explores the fallibility of infrastructure and the precariousness of perception, as seen through a materially-intensive, process-based lens. I utilize undulating planar forms in conjunction with fabric and rope as a metaphor for shifting landscapes, altered topographies, and imagined realities. References to the natural world and the built environment collide in interludes that are alternately beautiful, absurd, menacing, and poetic, alluding to the complexity of our world. Tensions between fact/fiction and dimensionality/flatness are endlessly intriguing to me, playing out in my work as a dialogue between reality and illusion. I have become fascinated with ropes and knotting as byproducts of my process. In my large-scale installations, knotted ropes provide tension that gives volume to otherwise flat materials. 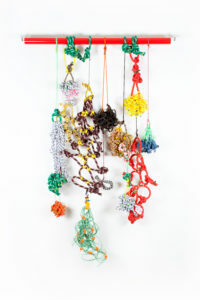 This technique has revealed the possibilities of knotting as an autonomous aesthetic expression. The varied use of rope and knotting across cultures and history ranges from utilitarian to decorative, and even deadly. I create interdependent knotted topographies that allude to both structure and malleability. The repeated act of tying by hand integrates an emphatic sense of strength, while the flexibility and nuance of the textile material ensures structural permutations. The resulting works are only quasi-architectural, providing metaphorical insight laced with humor as related to a variety of structural and systemic behavior.